My first blog piece on Gelbspan’s unexplained “Singer/Idso name switch” between the hardcover and paperback editions of his “The Heat is On” book told how his supposedly ironclad accusation had a significant problem from its inception. Now let’s see how Gelbspan’s accusation repetitions contain an odd embellishment. BRANCACCIO: … the Information Council on the Environment, funded by the Western Fuels Association, which mostly represents coal interests. ROSS GELBSPAN: And we got a copy of the strategy papers for that campaign. And it said that the purpose of the campaign was to reposition global warming as theory rather than fact. BRANCACCIO: Part of the Council’s strategy was to draw on several prominent global warming skeptics, scientists who argued that global warming is mired in unknowns. GELBSPAN: They sent these scientists all over the country to do media interviews. Gelbspan implies this was all part of the 1991 ICE campaign, however, Gelbspan never shows us the actual memos, perhaps because he is afraid we might see that Dr Singer’s name never appears in them, or that the phrase “all over the country” is quite a stretch in describing the extent of the campaign. 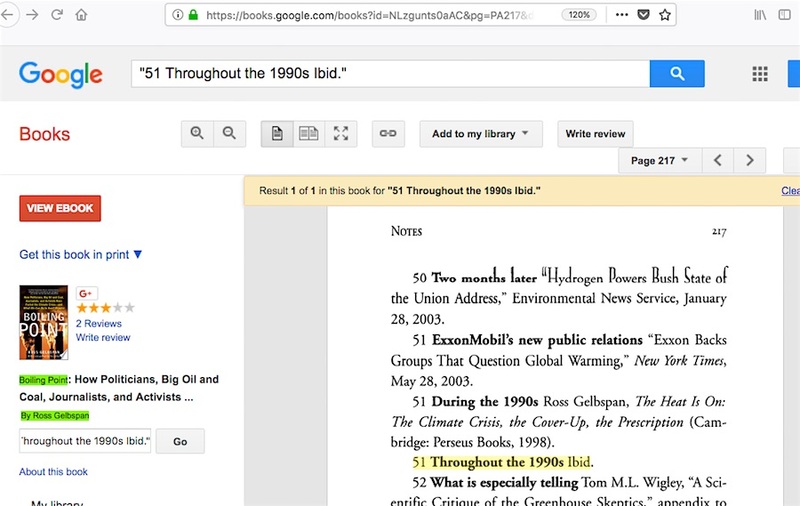 It took me seven months to find the ICE memos, placed in Greenpeace archives in a manner not conducive to easy discovery, but I’ll detail that major problem in a future blog piece my October 22, 2015 blog post. 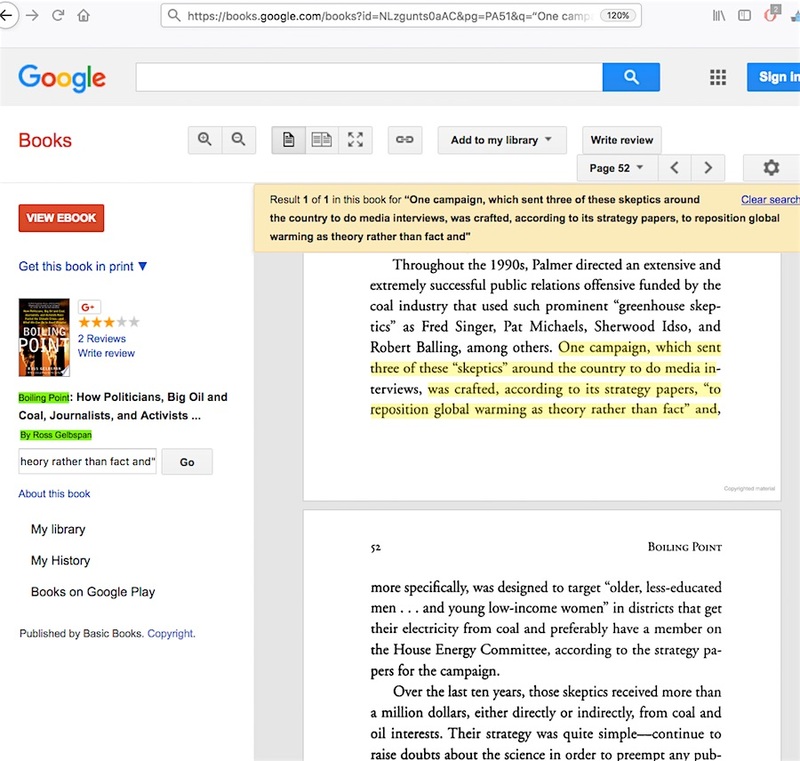 Click on Greenpeace’s ICE memo scans’ thumbnails for pages 7 (duplicated on 16), 12, 14, 18-19, 21-22, 30-33, 36-38, 39 (duplicated on 43), 41 and 44-47, and you see the town names of Flagstaff, Bowling Green, Chattanooga, Champaign,*(see notes below) and Fargo. No other places are listed for this PR campaign tour. Dr Idso is mentioned one single time on pg 12 regarding the actual tour, as a substitute for Dr Michaels in Flagstaff, and the only other town where a scientist was scheduled for a personal appearance was apparently Dr Michaels in Bowling Green. 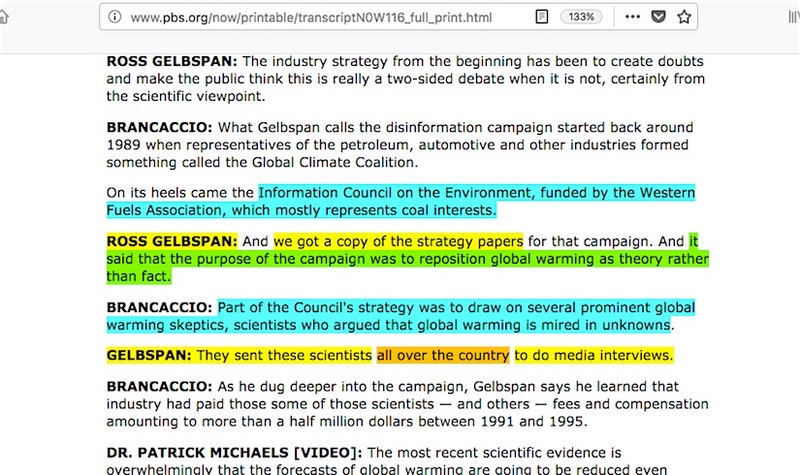 In this 1998 EnviroVideo interview uploaded to Youtube in 2007, Gelbspan portrays ICE’s “TV, radio and newspaper interviews” ominously, saying at the 4 minute 52 second point, “This is not subtle“. A PR campaign that is ‘not subtle’ would likely involve population centers such as L.A. Philadelphia, Seattle, Boston, Miami, Dallas, Chicago and Phoenix, and newspaper ads in the NY Times, LA Times, the Houston Chronicle, the Washington Post, and many others. A subtle PR campaign is one so small that it doesn’t bother with TV interviews,** (see notes below) and is otherwise almost impossible to document. 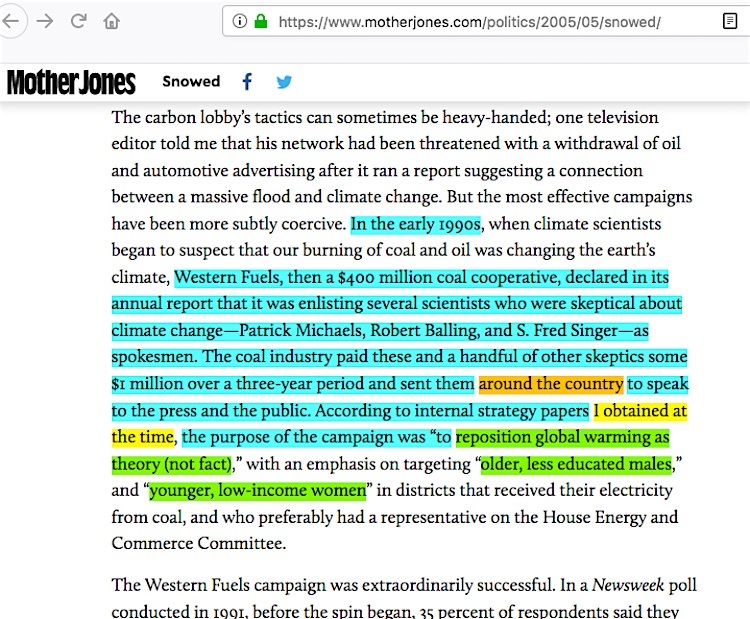 One more thing: The line Gelbspan had in the video and in the Mother Jones interview about the 1991 Western Fuels annual report ‘enlisting several scientists’ and ‘attacking mainstream science’…… the lack of those exact words in that ’91 WFA report, or anything actually resembling those phrases, will be the topic of a future blog piece my July 17, 2013 blog post here. Gelbspan’s interpretation of what “around the country” means is one of the lesser problems in his accusation narrative. [ Author’s notes 11/8/13, based on my promise not to erase critical items seen in my blog pieces: *Upon re-reading Greenpeace’s ICE docs scans, it becomes apparent that Chattanooga and Champaign were part of a Feb 1991 telephone poll to gauge public awareness if the global warming issue, and not part of the subsequent May 1991 pilot project PR campaign. Thus, Gelbspan’s ‘all over the country’ assertion gets reduced to just Flagstaff, Bowling Green and Fargo. This entry was posted in Embellishments, Irreconcilable differences and tagged ICE, Western Fuels Association by Russell Cook. Bookmark the permalink.